I have been thinking lately of taking a shot at the master rating, starting by increasing the number of rated games I play each year. If I just play more, I figure, I will move up. But I know I am missing one of the key ingredients of making master, which is a sporting desire to win. I really don't care so much about winning, I just enjoy playing and I'm satisfied to take a draw, especially if I'm not so much enjoying the game or the position. That's just a bad attitude, I know, and it has long cost me rating points and continues to do so. After Nxb5, which I played, any computer you ask will tell you I am easily winning, and I fully expected to win. But my opponent's behavior changed dramatically in ways that made winning beside the point for me. First he was mumbling and cursing to himself in a foreign language, despite my "shushing" him several times. Only after I got the TD to intervene (the TD said simply "Don't talk") did he quiet down. Then he began some silent antics, including slamming down his pieces with each move, accompanied by a hand gesture with a flat palm waved across the board, clearly meant to signify that his last move had stopped me cold. Though I could not help but laugh at the ludicrousness of his "moves," I was wasting a lot of time on the clock thinking about them. At this point he brought out his killer antic: acting like his pen had run out of ink. He scribbled furiously on his scoresheet with his dead pen, and then went to the cabinet several times to find a replacement. He acted out his utter amazement and disgust to find that our cabinet appeared only to contain dead pens, with which he scribbled in increasing frustration on his scoresheet, as if to prove to all who were watching that we had utterly failed him. He then went to the cabinet and brought back the entire collection of pens, which he dumped on the table and proceeded to try out one by one, increasingly agitated by his failure to find even a single pen that would work. At this point, the TD took it upon himself to intervene by handing my opponent a pen that did work. 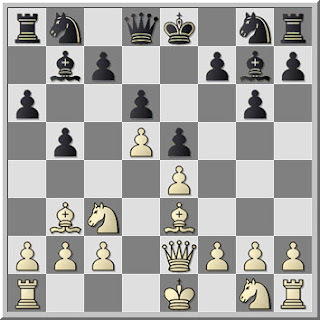 I was laughing to myself, thinking how I seemed to be playing Mr. Bean, but my clock was down to 20 minutes for the game against his 72 (as he was playing his own moves at blitz speed) and I had gone from pawn and positional advantage to a simple pawn advantage in an increasingly complex position. I was not sure that his actions were premeditated or intentionally distracting. What's more, I recognized that it made no practical difference whether or not they were, since what mattered was how I handled the distraction -- at which I was utterly failing. In the end, all I could think was, "Why am I sitting across from this bizarre specimen, when I would never willingly go near him outside of a chess tournament?" I offered him a draw, which he immediately accepted. A more sporting attitude would have turned my disgust into anger. I should have relished the idea of crushing this fellow, and should have turned him, in my mind, into a completely dehumanized bug to squash. I just wouldn't have enjoyed going there. I have been reading Andy Soltis's What It Takes to Be a Chess Master, which is a good read -- the type of book you can look at without a board and in short intervals here and there, and one that definitely gets you thinking. But Soltis is completely focused on chess knowledge in his presentation. And, though I hardly think I know everything, I feel that chess knowledge is not my problem. What I am missing is the right attitude. Maybe what I need instead is Chess for Tigers.